Originally posted: September 5, 2018 . Last modified: September 5, 2018 . Our easy deviled eggs are a quick finger food with a smooth and creamy filling paired with bits of sweet onion and crunchy dill pickle. 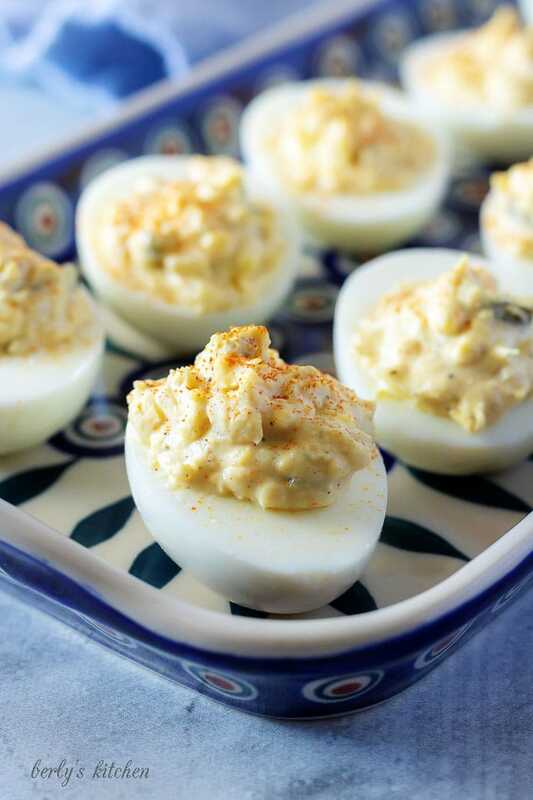 Easy deviled eggs are a big staple in Southern cooking in our household. They’re at most family picnics, get-togethers, and potlucks. I remember when my son was about two years old and tasted a deviled egg for the first time and he loved it. With that kind of endorsement, I can’t think of a better recipe to share with you today. Because, if a picky toddler loves them, how can you go wrong. 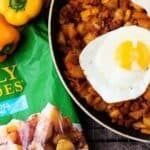 John started making this recipe a long time ago for Thanksgiving dinners and it has been a go-to dish all these years. It was a modified version of my father-in-law’s deviled eggs. A lot of John’s offerings were inspired by his father and grandmother. They never fail and are always a hit. How can you go wrong, right? John and I can’t wait for you to try our easy deviled eggs recipe and hope you love them as much as we do. First, place 6 eggs in a pan of cold water. The water should cover the eggs by an inch. You could add some salt if you wish or not. Next, bring the water to a rolling boil and shut the heat off. Don’t worry about letting them boil for additional time, they will finish cooking while sitting in the hot water. Then, cover the eggs and set a timer for 10 minutes. That’s plenty of time for the eggs to hard-boil. Afterward, when the 10 minutes have passed, remove the eggs from the water and place them in a bowl of cold water or an ice bath for an additional 5 minutes. Last, remove the eggs from the cold water and peel completely taking care not to gouge the egg whites. 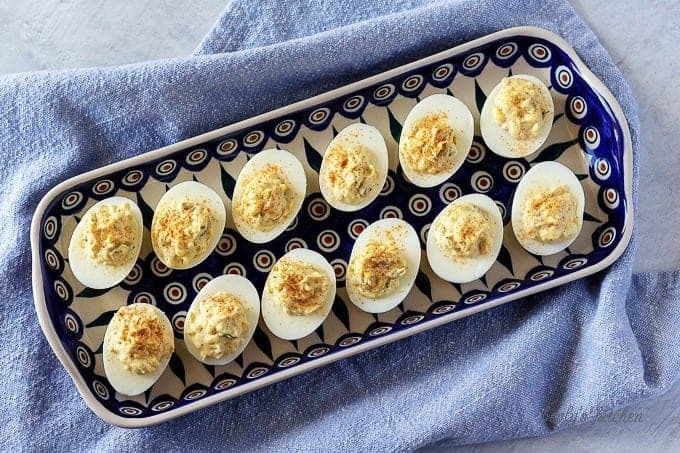 Otherwise, your easy deviled eggs won’t look so pretty. First, cut the eggs in half lengthwise and carefully scoop out the yolks to place in a medium bowl. Be careful, because they might be hot in the middle. Next, add the diced onions and pickles. A food processor or simple chopper will make this step a breeze. Then, combine the Dijon mustard, mayonnaise, salt and pepper with the yolks, onion, and pickle. Once again, toss everything in one bowl and mix. Last, use a fork to combine the mixture until a smooth, creamy filling comes together. We prefer a fork for this step, but feel free to use whatever you like to mix the ingredients. First, fill a pastry bag or decorating kit with the yolk filling. If you don’t have either or just don’t want the mess, then feel free to use a spoon. Next, fill half an egg with the mixture. John or I usually fill them until they are about a half-inch above the egg white. Then, repeat the process with the remaining yolk mixture until all of it is used. However, if you don’t use all the mixture, that’s okay. It makes a great sandwich filling. Last, garnish the easy deviled eggs with paprika for color and flavor. On the other hand, you could use cayenne powder for a real kick on the taste buds. 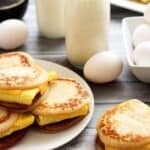 Feel free to make these eggs without mayo by substituting Miracle Whip for a tangy kick. For a smoky, spicy flavor consider making our easy deviled eggs with bacon and cayenne pepper. If you don’t want to deal with dicing pickles, then simply make your deviled eggs with relish. Check out our other great appetizers, like our Crab Stuffed Mushrooms or our Oven Baked Potato Nachos! 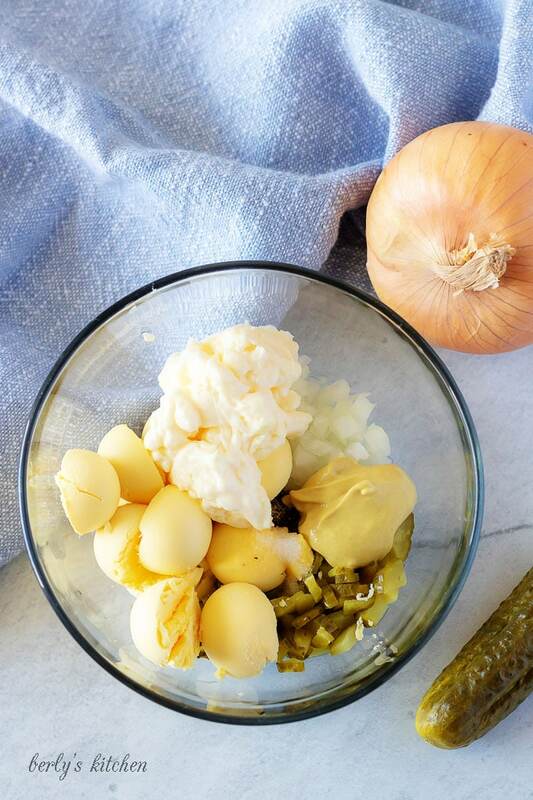 Our easy deviled eggs are a quick finger food with a smooth and creamy filling paired with bits of sweet onion and crunchy dill pickle cradled in half a boiled egg. First, place 6 eggs in a pan of cold water. The water should cover the eggs by an inch. Next, bring the water to a rolling boil and shut the heat off. Then, cover the eggs and set a timer for 10 minutes. Afterward, when the 10 minutes have passed, remove the eggs from the water and place in a bowl of cold water or an ice bath for an additional 5 minutes. Last, remove the eggs from the cold water and peel completely taking care not to gouge the egg whites. First, cut boiled and shelled eggs lengthwise and remove yolks. Place them in a medium bowl. 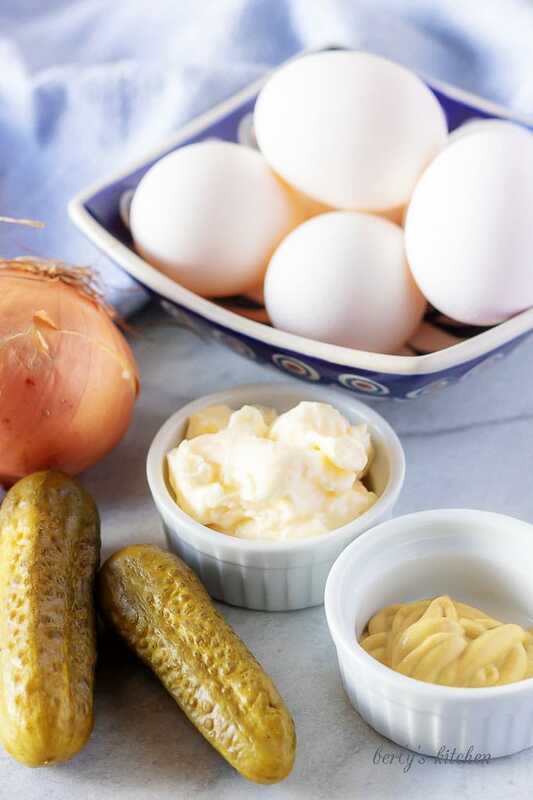 Next, add onion, mayonnaise, pickle, mustard, salt, and pepper to yolks. Using a fork combine until creamy filling forms. Then, using a pastry bag or decorating kit, fill each egg white with the yolk mixture. Last, garnish with paprika and serve. Store any leftovers in your fridge. The calories listed are an approximation based on the ingredients and a serving size of one deviled egg. Actual calories may vary. Ant leftover eggs can be stored in your fridge in a sealed container for up to 3-days. My kids love eggs as well, they do change their preference on how to get it cooked often though. Good to have a few different recipes in hand. Loved your recipe. The pictures are beautiful too . Thank you, Syama! We really appreciate your comments 🙂 You can always add a little more mayo or miracle whip to this recipe, spread it on some bread and bam, you have egg salad sandwiches lol! 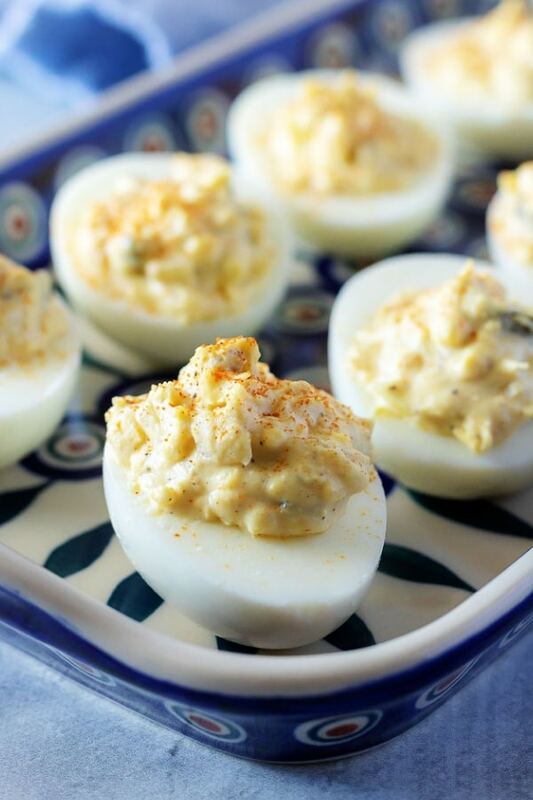 We love deviled eggs and they are so easy to make…except the peeling them part lol. Thank you, Bridget! I agree, peeling eggs can be a nightmare lol! 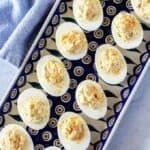 love deviled eggs – these look great! I have actuall never made deviled eggs! I can’t wait to try! Thank you! I am glad you are going to give them a try. They are really easy to put together and they are the perfect little snack lol!